The time has flown. What have I done in the meantime? It’s been my rest period: I’ve eaten what I liked (including a fair amount of rubbish, it has to be said) and simply taken it easy. There’s been some spring cleaning in the household, more time spent with my wife rather than out on the trails for hours and simply catching up on a dozen other things that fall by the wayside when training hard. I had been planning on running the excellent Charnwood Marathon near Loughborough last weekend (which would have been absent last year’s 2 foot of snow across the whole course!) but, when it got to the night before, I just didn’t feel like it. The previous day I’d hammered out a quick 3 miles, my first run since Jordan, just to see if my legs still could: I felt a little sore the next day but that was to be expected at 8m30s miles mostly on an incline. The short run did though tell me I wasn’t yet ready. But that’s fine. Post a multi-stage event the distance is still in the legs for a short time, the speed mostly gone, but the desire needs to return. And last weekend it wasn’t there. Again, that’s perfectly fine. A leisurely breakfast reading the papers in Costa followed by an afternoon’s therapeutic spring cleaning was equally as rejuvenating. 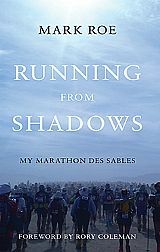 The itch would appear soon enough, just as it did almost 2 years ago when I returned from the Marathon des Sables. And today it happened, I began to feel the itch. It’s been a busy and productive time at work and after a late finish the signs began to appear on my way home: my legs felt energised and needing to turn over in a rhythmic canter; my mind needed to feel a different focus other than work and study; I now felt the need to expunge a few weeks of dietary toxins. Outside, spring is well and truly on its way, the temperatures are milder; it’s still dark at 7.30pm but there lies the promise of lighter evenings from this weekend as the clocks leap forward towards summer. So once back home it was easy to put on my running shoes. In the dark the fine drizzle was refreshing. A nice and easy 5.25 miles around the quiet streets for 50 minutes of mindfulness: a neighbour’s having an extension built . . . I wonder why? . . . there’s another runner . . . I wonder what she’s training for, if anything . . . the blossom on that tree is particularly plentiful; I don’t remember that last year . . . the delicious smell of hardwood logs burning in a few home’s fires . . . now I’m home. Feeling the itch, at last.